In the distance, we could see Topkapi Palace sitting high on a cliff, the sparkling Bosphorus laid out before it. Like all good palaces, it has the best views. “There’s Topkapi Palace” our companion pointed out to us. “Yes, it’s beautiful. We’ve actually been here before” I said, remembering that on our last visit, Topkapi Palace was one of our Turkey highlights. We were on a ferry having just arrived in Istanbul. Our plane had landed on the Asian side, and we wanted to get to Sultanahmet on the European side. Little did we know how tricky it is. Fortunately, when we asked this amazing man for directions, instead of just pointing out the bus station he offered to show us the way! And it was a long way. We’d already caught two buses and walked for what seemed forever, before catching the ferry. And we still had a tram ride ahead of us. There was no way we could have got there without his help. He even insisted on paying our fares! We tried several times to give him money but he refused all our attempts point blank. Even when he had to reload his travel card! This story isn’t unusual in Turkey. And everywhere we went we encountered helpful generosity from the Turkish people. 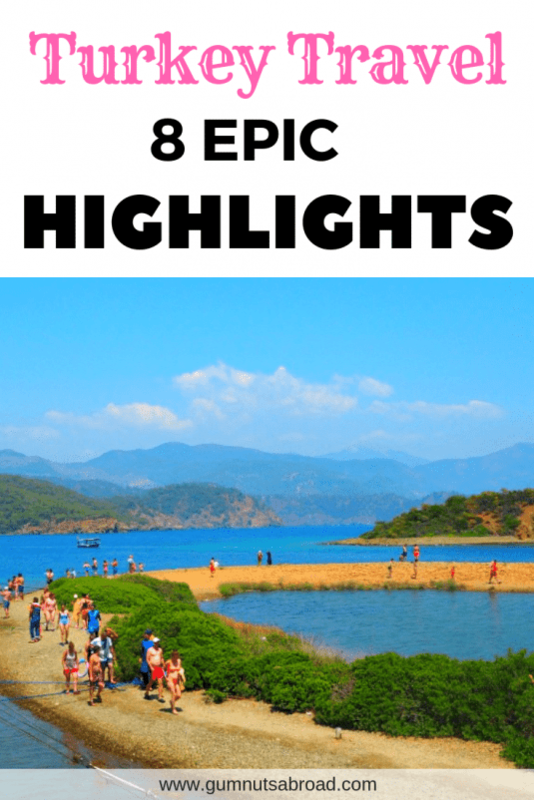 Please note: These highlights are from our recent trip to Turkey, and doesn’t mention two Turkey must-sees that we saw on our first visit. First are the soaring rock formations of Cappadocia. Filled with walking trails, underground cities and rock-cut churches it’s not to be missed. We visited in winter and it was an enchanting wonderland of snow-covered fairy chimneys. The other is the Gallipoli peninsula a place every Australian and New Zealander should visit once in their lifetime. During WW1 a military disaster happened here, in which over 58,000 Allied soldiers and 87,000 Turkish troops died. The day of the landing, 25th April 1915, is often referred to as the day Australia was born as a nation. It became known as ANZAC Day and the ANZAC “spirit” is now an integral part of the Australian culture. 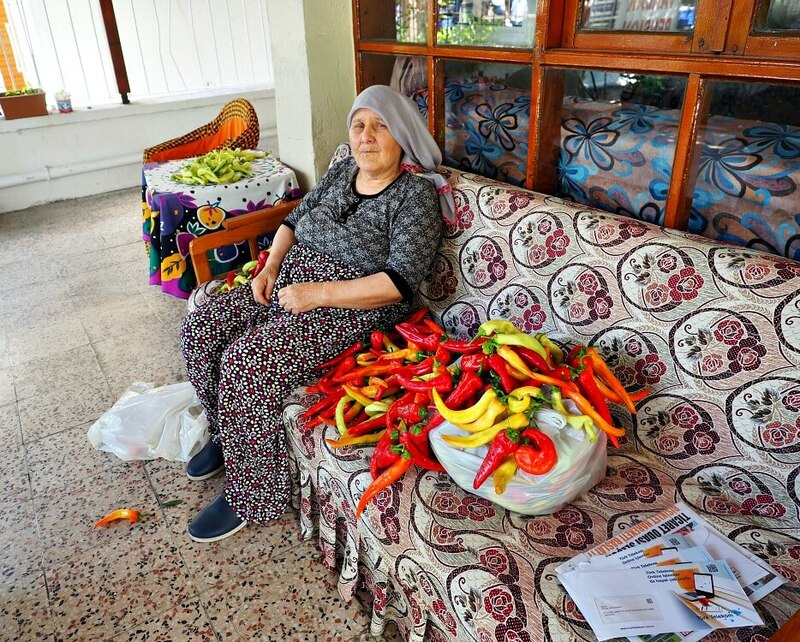 Turkish people have a generosity of spirit that we haven’t encountered anywhere else in our travels. From the university students who phoned our hotel to find out where it was located. To the man who abandoned his daily walk to help order our breakfast because he could speak English. They all stopped what they were doing to offer their help with what seemed like an endless supply of patience. And it was always given with a smile and a pat on the back! 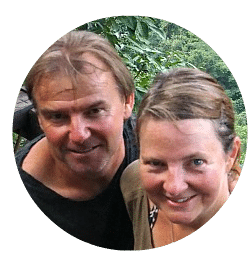 Their gregarious nature is infectious and we found ourselves laughing along. Even as they tried to sell us something! This woman at our guesthouse loved to chat and was always offering us food! Sultanahmet is in the heart of Old Istanbul and is the best place to base yourself for sightseeing. All the history and beauty of the city are within walking distance just waiting for you to explore. 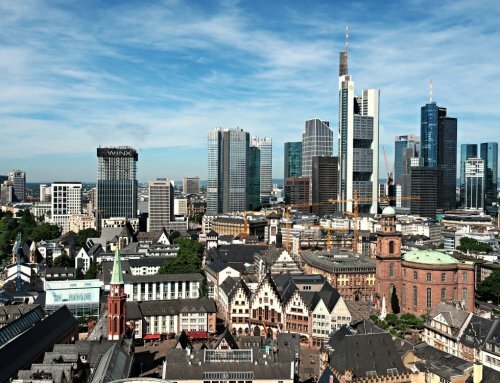 We love its mystical atmosphere and it’s one of our favourite cities in the world. Here are some of our Istanbul highlights. It had been nearly twenty years since our last visit to the Blue Mosque. And I must admit, sometimes things aren’t as good the second time around. The thrill of that first experience just isn’t there. But that wasn’t the case this time, the mosque is breathtaking and we loved seeing it again. The words beautiful, stunning, amazing have all been used to describe the Blue Mosque. And for good reason, it’s why millions of people visit it every year. Known by Turkish people as Sultan Ahmet Mosque, it’s called the Blue Mosque by tourists because of the 20,000 blue tiles that are found in its interior. Together with its 260 stained glass windows and domed ceiling, it’s a truly incredible sight. 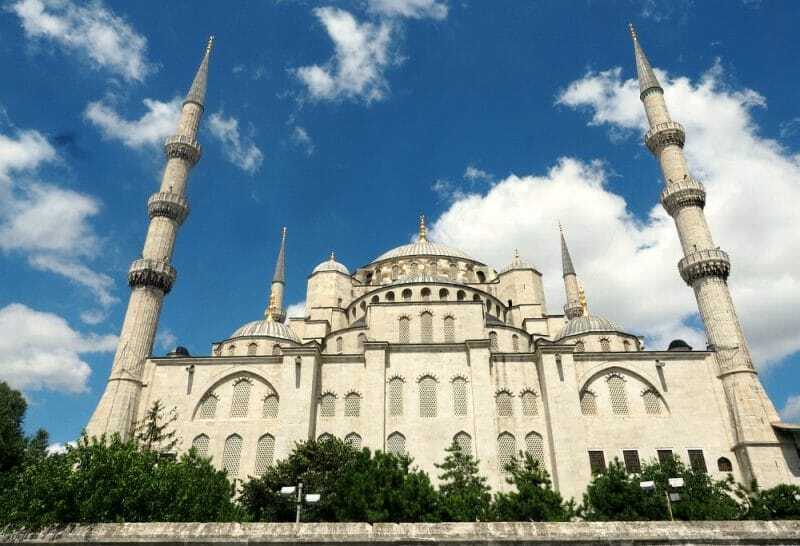 When planning your visit to the Blue Mosque, remember that it’s still a working mosque and as such is closed to tourists for ninety minutes at prayer time. 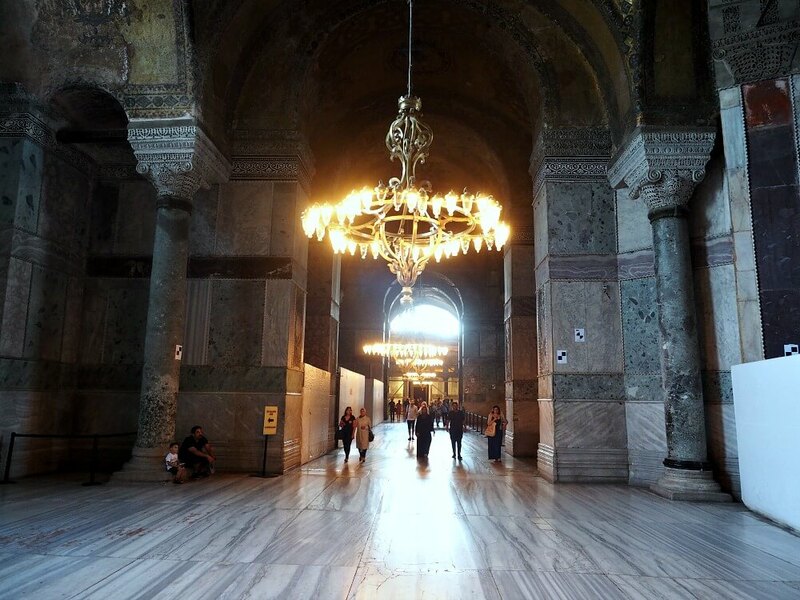 The Aya Sofya (Hagia Sophia) is considered one of the greatest surviving examples of Byzantine architecture. It was once a Christian church before being converted to an Islamic mosque. Amazingly it still has some Christian features, including a stunning mosaic of the Virgin Mary with Child. I love its ethereal beauty and think it’s even more spectacular than the Blue Mosque. Topkapi Palace was built between 1459 and 1465. It was home to one of the world’s most powerful dynasties and for four centuries it was the political centre of the Ottoman Empire. It’s where battles were planned, politics discussed, laws created, religious affairs organised and visiting dignitaries were hosted. Set amongst beautiful gardens and cypress trees with the Bosphorous shimmering in the background, it’s a truly stunning sight. When I saw the decorative paintwork, ceramic tiles and incredible architecture of the palace, I couldn’t help but wonder at the opulence of the people that lived there. I loved seeing the Harem, home to the sultans’ wives and children, with its tiled walls and golden decorations. Inaccessible to the outside world, and with walls ten feet deep, life here must have been incredibly insular and claustrophobic. There’s a cafe here with glorious views where you can relax with a drink before moving on to your next museum. 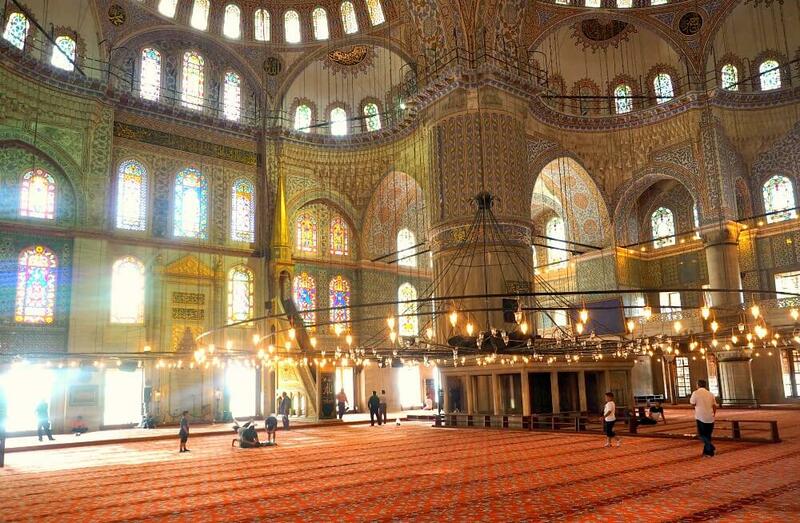 TIP: If you plan on visiting most of the sights in Istanbul it’s worth buying a museum pass. 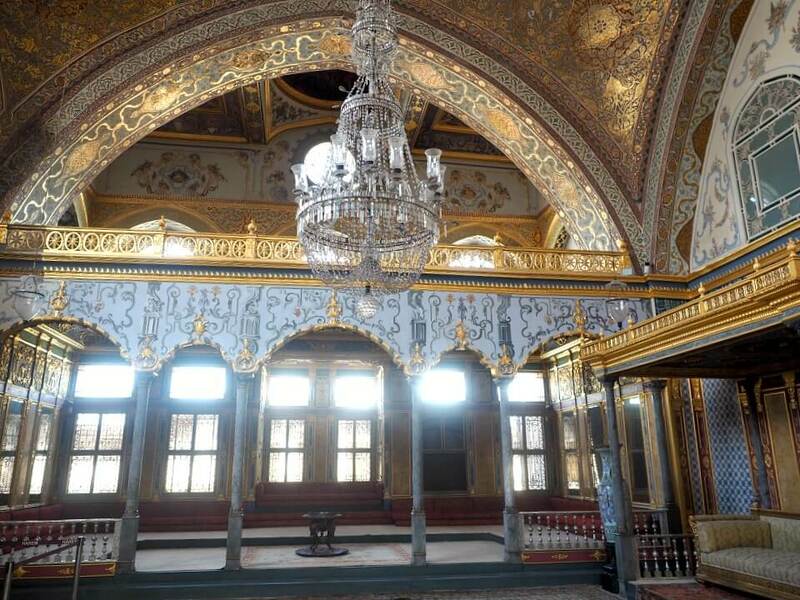 It includes added bonuses like the Harem which costs extra and is not included in your Topkapi Palace ticket. And you get to skip to the top of the ticket line! You can find out more about it here. 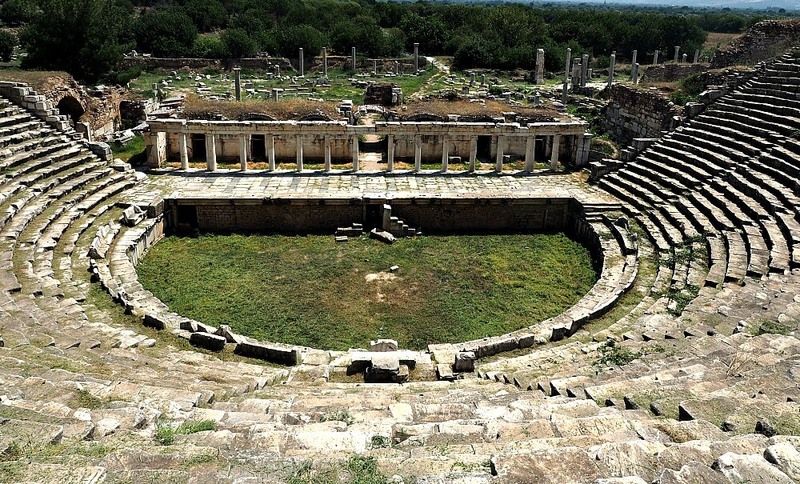 First-time visitors to Turkey are often surprised to find it teeming with fantastic Greek and Roman ruins. In fact, it’s where we first discovered our love of ancient things. On any trip to Turkey, we recommend packing a pair of sturdy shoes along with your imagination and an appreciation for history and archaeology. Here are a few of the sites we visited, but just about any town you visit will be within easy reach of a ruin or two. 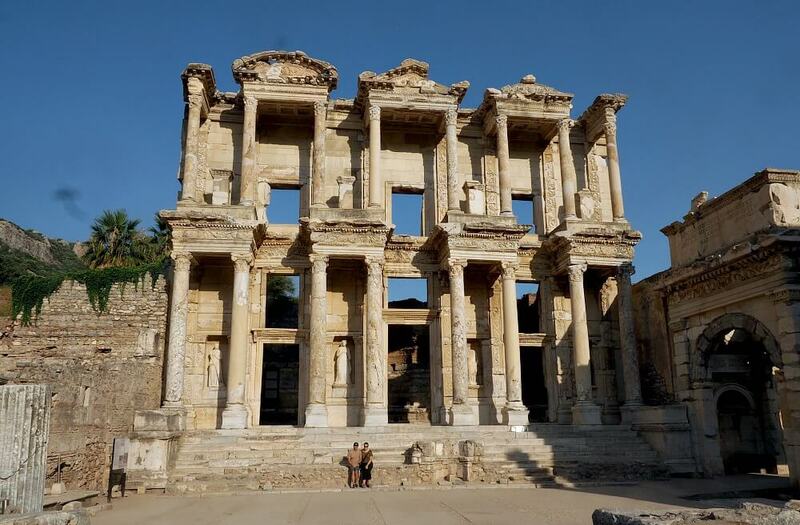 You can’t go to Turkey and not see Ephesus. It was built in the tenth century B.C. and at its peak, nearly 300,000 people lived there. It’s one of the best preserved ancient sites in the Mediterranean and it never fails to amaze visitors. One of the best things about Ephesus is that you get a sense of what walking down a Roman street must have been like. Even the crowds of tourists add a realism as the streets would have been crowded with people going about their daily lives. The Library of Celsus is a big drawcard, and it’s fantastic, but keep an eye out for other reminders of a past life. 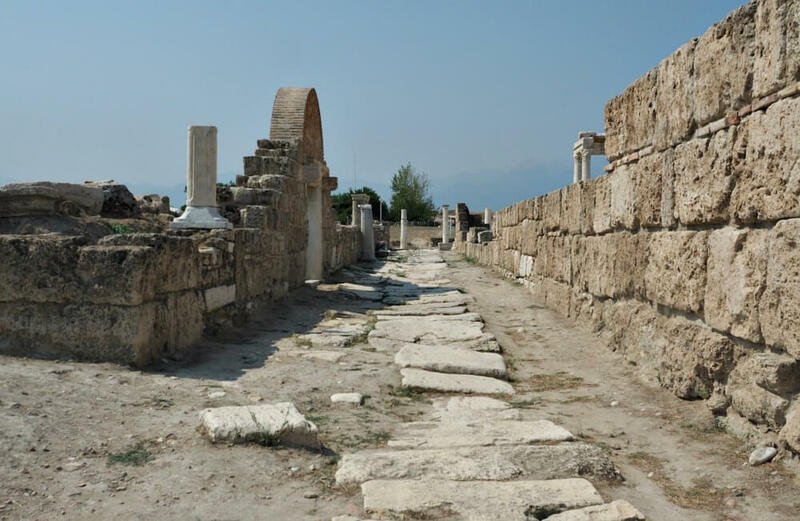 Such as chariot ruts in the marble road and the public latrines where people sat and chatted to their neighbour while doing their “business”! If you’re interested in what family life was like back then we recommend paying extra to see the Terrace Houses. They are thought to have belonged to upper-class families and are covered in amazing mosaics and frescoes. As an added bonus you get to see archaeologists at work! Aphrodisias is off the backpacker trail and it took us over two hours to get there. But boy, was it worth it. More than once we stood with our mouths open stunned by what we saw. The ruins are spread over a wide area and there’s a superb museum with some excellent statues. The city was named for and dedicated to the love goddess Aphrodite. Interestingly it was a fertility cult centre from around 9000 B.C. The main highlights of the ruins are the Temple of Aphrodite, the theatre and the huge stadium. Oh my gosh. The stadium! There’s an information board that says “…the largest ancient stadium in the world…” and at 270 metres long and able to hold 30,000 people the sheer size of it took our breath away. 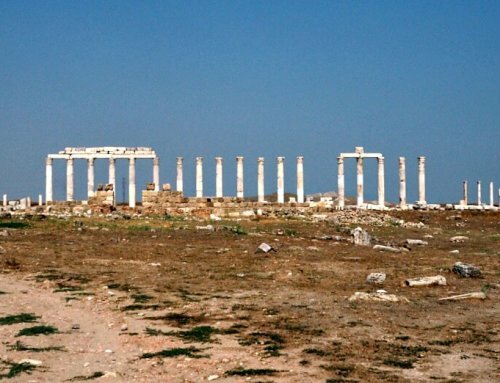 Laodicea was home to one of the Seven Churches of Revelation and it had a large population of Christians and Jews. It’s not a well-known site and most of it lies in ruin. But it’s well worth your time and if you make the effort you’ll most likely have it all to yourself. We thoroughly enjoyed our morning there and you can read about it here. Not really an ancient city but a modern ruined one, Karakoy is an eerie ghost town. It was once a thriving Greek community with schools, churches and shops where Greeks and Turks lived happily side by side. 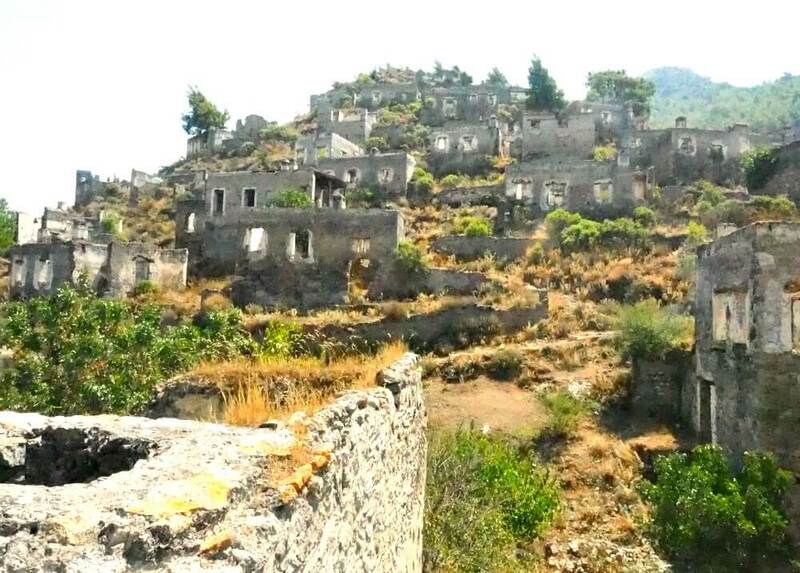 Sadly the town was abandoned at the end of the Greco-Turkish war (1919-1923) in a population exchange with Greece. Christian Greeks living in Turkey returned to Greece, and Muslim Turks living in Greece returned to Turkey. Karakoy is nestled on a hillside and has around 4000 roofless stone houses and buildings. There are two churches that still retain some decoration and mosaic floors. Unfortunately, they were closed on the day we were there. It’s a steep climb to the top of the hill, and the narrow weed-filled streets are full of rocks and broken steps. So wear sturdy shoes and sun protection in summer. It’s possible to do a half day trek from Karakoy to the nearby town of Oludeniz. We’ve been told it the walk has spectacular views but as the temperature was in the high 30s we chose not to attempt it. Instead, we bought ice-creams from a man doing business out of an abandoned building. It was a bit bizarre enjoying an ice-cream in an abandoned ghost town. But boy, it was delicious! 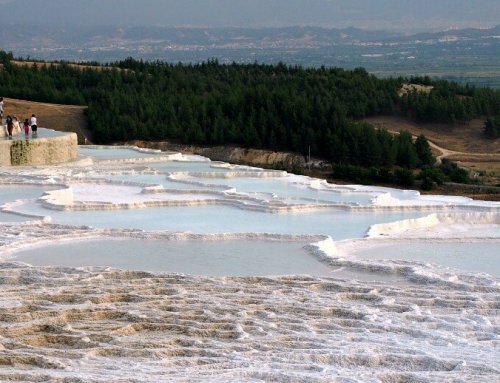 A highlight of any trip to Turkey is Pamukkale the “Cotton Castle”, so named because of the travertines that look like a castle made of fluffy white cotton. We didn’t visit Pamukkale on our previous trip so we were excited to visit this time around. There’s a lot more to do than just see the travertines. And we were surprised by all the fun things to do in Pamukkale. 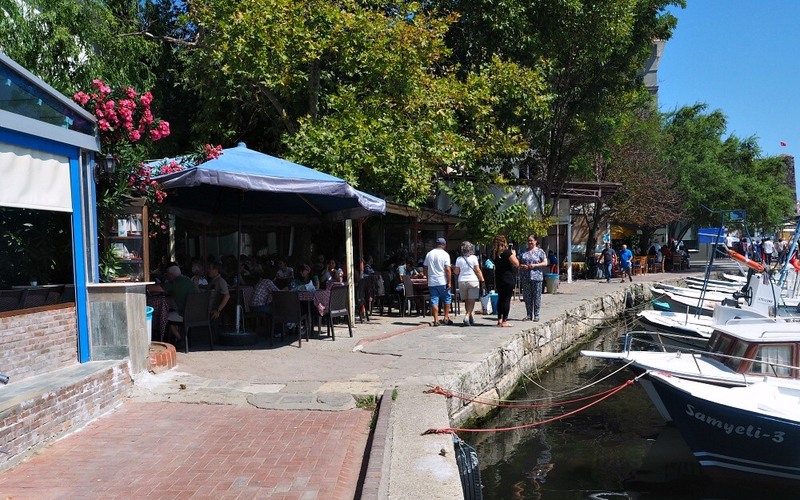 One of the most popular boat tours in Fethiye is the 12 Island Boat Tour. It’s an odd name as the boat only stops at five or six islands and sails past the rest. But it’s still a fun day out and a great way to see the coastline. The islands don’t really have beaches like you might find in Thailand, it is Europe after all. But who needs beaches when you can jump off the boat into crystal clear water! The boat stops for about 45 minutes at each island so you get plenty of time for swimming. There’s a shower on board for rinsing off but you need to bring your own towel. We paid $A20 each and the price included lunch which was fish or chicken, pasta and salad. There was also a bar selling snacks. You can book a tour with any of the boats moored along the jetty. 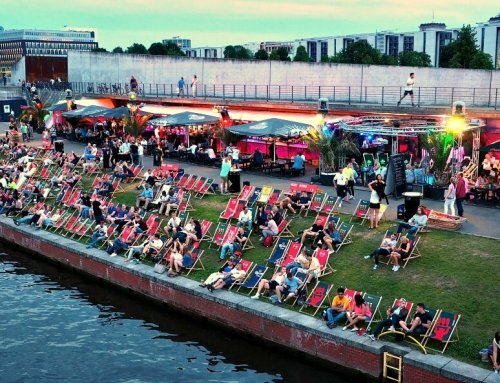 But some of the tours are booze cruises that have loud music blaring all day. So, if that’s not your thing be sure to check what type of tour it is when you book. Our boat was called Grand Toraman and it was a lovely relaxing cruise with attentive staff. I can’t tell a lie though, after lunch, there was music and dancing! They played traditional Turkish songs and we had a blast singing along enjoying the party atmosphere. Never have we swum in such warm water as we did in Oludeniz. It was like diving into a warm bath. To be honest it’s so warm that on a hot day it’s not very refreshing. But the turquoise water is absolutely stunning and the para-gliders flying overhead add splashes of colour to the sky. Oludeniz is one of Turkey’s top destinations for tandem paragliding. In fact, I think paragliding is possibly more popular than swimming! People can be seen jumping off the mountain from dawn to dusk. The fun part is that they land on the strip of road in front of the beach and sometimes, even on the beach! 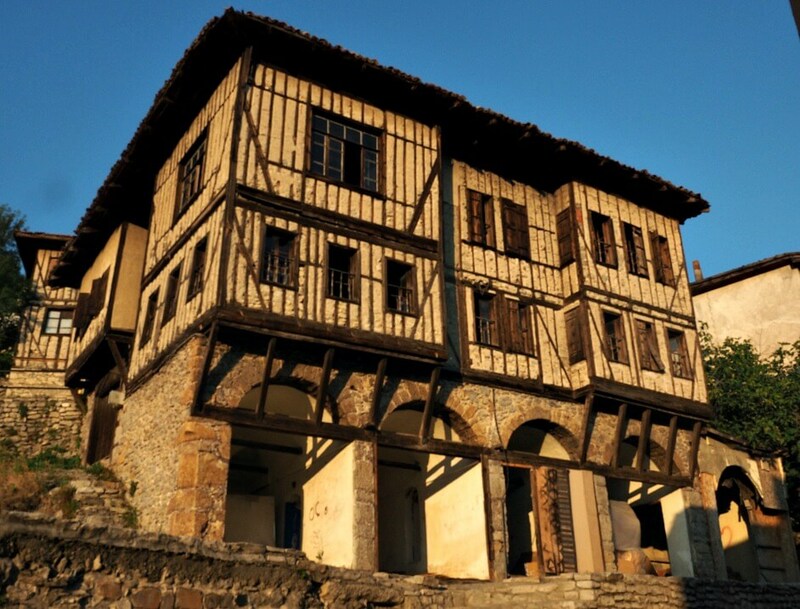 Located in the Black Sea Region, the city of Safranbolu is a UNESCO World Heritage Site thanks to its beautifully preserved old Ottoman buildings. The town brings history to life through its historic mosques, shops, cobbled laneways and traditional houses. The houses are two or three stories high with simple floor plans, walnut panelling, big windows and wooden shutters. The best part is, that many houses have been turned into character-filled hotels and guesthouses. So you can stay in one! We stayed at Efe Guesthouse, it’s in a great location and the price of a night here includes breakfast in a sunny room with views of the town. Safranbolu was once popular with traders for the spice saffron that grew there. Now it’s popular with tourists who buy saffron infused drinks, sweets and soaps. The narrow laneways are filled with shops and cafes and it’s a great place to try some Turkish Delight. Shop owners stand in doorways carrying trays filled with the treat enticing visitors to try some. Enter their store if you dare! The Black Sea Coast is the ideal destination for those who like to avoid the usual tourist traps. You won’t find many foreign visitors here and English can be a problem, but it’s great for getting off the beaten track. We spent about ten days here before heading to Georgia and loved how authentic it was. 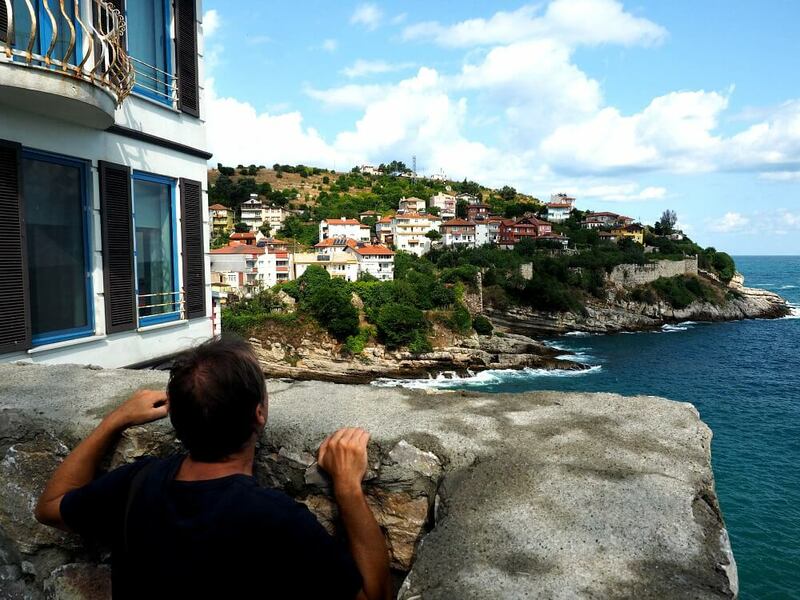 Amasra, with its two harbours, is easily the Black Sea Coast’s prettiest town. It has castles and buildings dating back hundreds of years, along with a museum to explain it all. But, it’s not the castle or museum the local holidaymakers come to see. 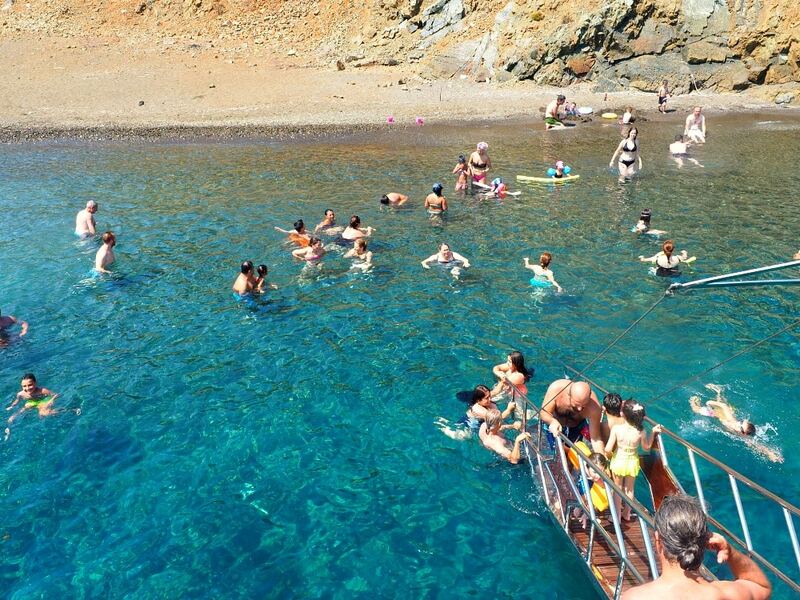 They come to enjoy the beach, to swim in the Black Sea and to take a boat ride out to the nearby island. We didn’t take a boat ride, but if you come here make sure you climb to the top of the castle for views of the gorgeous town. Yep I can see it! The walled city of Sinop with its natural harbour was once a major port. It was considered a safe place for boats to dock as its land approaches were protected by the citadel and its seaside by a strong wall. It has a lovely waterfront with the remains of a castle overlooking the Black Sea. We were surprised by how cosmopolitan it is, with cafes all along the seafront. It was a lovely spot to have breakfast in the sea air with the gulls flying overhead. Our favourite thing to do here was visiting the old Sinop Prison. 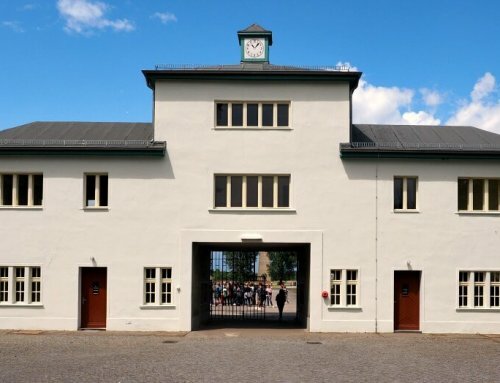 The cells, corridors and exercise yard have all been left untouched. Unfortunately, there isn’t much signage so information is limited. Nevertheless, the cavernous rooms have an eery spookiness that is oddly fascinating. Stormy Sinop. We were nearly caught in a thunderstorm! 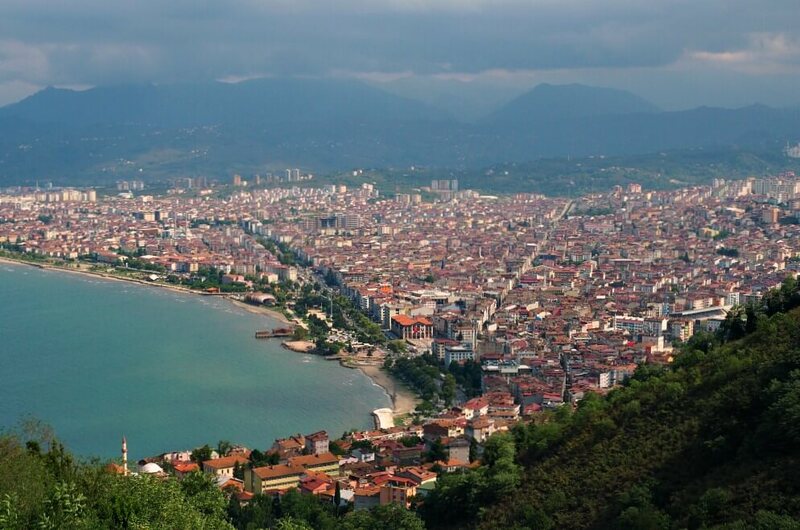 Ordu has loads of old world charm with its winding alleyways lined with timber-framed houses and old-fashioned seafront. It’s blessed with a mild climate and plenty of rain making the land perfect for growing fruit, vegetables, and hazelnuts! This is where Nutella comes from (well the nuts anyway). Ordu produces most of the world’s hazelnuts making it integral to the town’s economy. If you visit at the right time of year you’ll find them drying in the sun all over town. A popular Ordu attraction is the cable car that takes you to the top of the mountain. There’s shops, cafes, paragliders and of course fantastic views over the town and harbour. We decided to take the cable car one way and walk back down, it wasn’t far and we got to see where the local farmers live and work. There are some nice beaches on either side of town but it was a bit too chilly for us to go swimming. Tip: Have breakfast at Gesto Cafe and Restaurant, it was the best we had in all of Turkey! The manager speaks English and was helpful with lots of tips for the area as well. These are just a few Turkey highlights, there’s so much more to see and we hope to visit again one day. As for our good Samaritan, he wished us well and with a pat on the back said goodbye at the tram stop. You can find more information for your Turkey holiday by clicking here.